A massive petrochemical fire at Intercontinental Terminals Co. in Deer Park, Houston on March 18. Roughly 1,000 people sought treatment at a pop-up treatment center for symptoms including nausea, headaches, and respiratory problems after Intercontinental Terminals Co.’s (ITC) chemical storage facility in Deer Park, Houston caught fire this week, Bloomberg reported on Friday, with at least 15 cases dubbed serious enough to warrant a transfer to local emergency rooms. ... 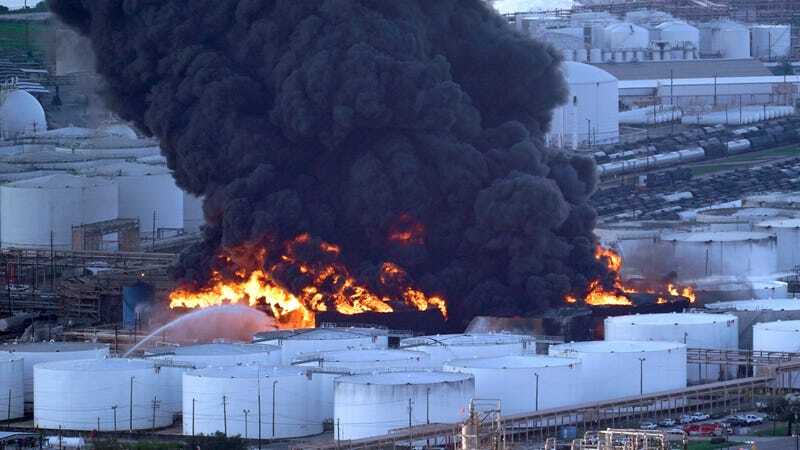 Since the initial blaze was squelched earlier in the week, ITC made two unsuccessful attempts to drain a charred tank that’s holding pygas, a petroleum derivative composed largely of benzene. Early on Friday, ITC executives estimated they would have that tank emptied in about 12 hours; then the wall failed and flames erupted nearby. Jerry Mouton, mayor of nearby Deer Park, told media on Saturday that “It’s been a never-ending, re-occurring case of things not working out as planned,” Bloomberg wrote. The news agency added that while ITC said approximately 2.52 million gallons of hazardous chemicals remained within the damaged facility as of Friday, on Saturday it said it could not produce a reliable estimate. ITC said no worker injuries were reported during the second fire, according to Reuters, though the company did have to request the third shelter-in-place order for local communities of the week. At the time of the repeat incident, an ITC spokesman said the company and authorities were working on a plan to contain the spread of contaminated chemicals, Reuters wrote. Texas Attorney General Ken Paxton has filed a lawsuit against ITC, saying the company violated state clean air ordinances, NPR reported. As Earther previously reported, Environmental Protection Agency National Air Toxics Assessment data shows the communities surrounding the ITC facility in Deer Park such as Manchester, Harrisburg, Meadowbrook, and Allendale already face some of the highest cancer risks in Houston from ethylene oxide emissions. The ITC facility in question has, since 2003, usually experienced at least three unauthorized emissions of air contaminants a year. The Union of Concerned Scientists released a report in 2016 warning that Manchester (“98 percent minority and 65 percent low-income”) is frequently exposed to toxic chemicals including 1,3-butadiene, benzene, ethylbenzene, styrene, toluene, and xylene. In January 2017, former President Barack Obama finalized an updated Risk Management Program Rule to help prevent these types of accidents and improve emergency responses when they do happen. However, the EPA under President Trump was quick to delay the rule, just a few months after it finalized. A court reversed that move, but the agency is still proposing a replacement. While the containment wall damaged in the original fire at the ITC facility has been rebuilt, according to Bloomberg, but the wall must be reinforced before further attempts to pump remaining chemicals out of the facility can resume.